A - Poured copper orange with a little late evening sky. S - Sweet and floral along with pine and malt. T - Citrus, grapefruit, lemon and a little wheat, orange and bitterness. M - Medium body with a little bit of a dry and crisp finish. O - I will more then likely get another six pack of it this summer but Im not rushing out to do it. The clear dark reddish amber liquid pours out into a Duvel glass with a 1/2” off white head that recedes slowly but visibly leaving a ring and nice pattern of lacing on the sides of the glass. Sipping creates lots of small patches and legs of lacing, a few of which slide back down to the liquid. By mid-way through the beer there’s almost no foam left on the surface but there is still lots of lacing clinging to the sides of the glass. The aromas include lots of biscuity malt with a bit of lemon in the background. There’s also some spicy, almost peppery character back in there as well. Much as expected from the nose there’s the biscuity malt which brings with it some sweetness. There’s also some lemony bitterness as well as some spicy, almost peppery grassiness. The mouthfeel is on the light side of medium bodied and fairly smooth with only a slight prickly sensation from the very light carbonation. The finish begins as the sweet biscuity character begins to fade, allowing some lemony bitterness to show. By the medium length ending there’s a bit of spicy grassiness in the back of the palate. This beer is fairly enjoyable and I’d be happy to have a few more as a summer refresher. It’s light in flavor, gentle in carbonation, and has a slightly dry, slightly bitter ending that invites another sip. 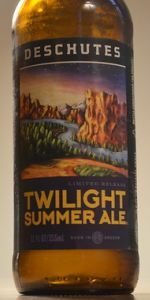 This beer would be a good one to have on offer in a cooler at an outdoor summer party. While not particularly challenging it is easy going and enjoyable. 12 ounce bottle into pint glass, best before 6/20/2018. Pours slightly hazy/cloudy deep golden amber color with a 1-2 finger dense and rocky off white head with fantastic retention, that reduces to a nice cap that lasts. Thick soapy lacing clings on the glass, with a fair amount of streaming carbonation. Fantastic appearance. Aromas of lemon, orange, grapefruit, peach, pear, red apple, honey, wheat, white bread dough, lightly toasted biscuit, herbal, floral, grass, light pepper, and yeast earthiness. Nice and pleasant aromas with good balance and complexity of citrus/earthy hops, bready malt, and moderate fruity yeast notes; with solid strength. Taste of lemon, orange, grapefruit, peach, pear, red apple, honey, wheat, white bread dough, lightly toasted biscuit, herbal, floral, grass, light pepper, and yeast earthiness. Mild pine, herbal, grassy, peppery, citrus peel bitterness on the finish. Lingering notes of lemon, orange, grapefruit, peach, pear, red apple, honey, wheat, white bread dough, lightly toasted biscuit, herbal, floral, grass, pepper, and yeast earthiness on the finish for a good bit. Very nice complexity, robustness, and balance of citrus/earthy hops, bready malt, and moderate fruity yeast flavors; with a great malt/bitterness balance, and zero cloying/astringent flavors after the finish. Fairly crisp/clean finishing. Lightly increasing dryness from lingering bitterness. Medium carbonation and body; with a very smooth, moderately bready/grainy, and lightly sticky mouthfeel that is great. Zero warming alcohol as expected of 5%. Overall this is a delicious American blonde ale. All around nice complexity, robustness, and balance of citrus/earthy hops, bready malt, and fruity yeast flavors; very smooth, crisp, clean, and refreshing to drink with the milfly bitter/drying finish. Great balance of citrus/earthy hops, pale/Munich malts, and restrained fruity English house yeast complexity. A very enjoyable offering, and spot on style example as expected of the brewery. I was pleasantly surprised to see this one stacked up in a private Vancouver store, but didn't want to waste my budget on another blond. Then even more pleasantly surprised to find this on tap at St. Augustine's. It was plasantly surprisingly hoppy, this is a pale ale, with orange citus taste. Faint hops. Nicely drinkable. Nice smooth beer, a little hoppy for me. Nothing too profound about this one - just a nice, pleasant summer blonde with a solid hop presence and smooth finish. Summer beers are some of my favorite, so I don't know if it stands up among the best, but I can see myself buying a six pack a year. Brilliant deep golden with copper highlights and a frothy cream head. Aroma is zesty, with grass, light floral notes, and that signature Amarillo savory character. There's a hint of bready malt. Flavor is slightly fruity, likely attributable to specialty malt, with floral, perfumey notes, a touch of citrus, and a grassy, almost piney, earthy, crisp finish. Very clean and refreshing, though the perfumey character is somewhat overwhelming. 12oz bottle into pint glass. Pours a clear, light golden yellow with a thin white head. Had a mild aroma of grassy and faintly citric hops with a well balanced bready malt. The taste is again of grassy hops with a quick bready malt finish. The mouthfeel is medium bodied with active carbonation and a lightly crisp, refreshing finish. A crisp and refreshing beer that is perfect to enjoy with the summer months.